Amphiaraos is one of the lesser known deities of ancient mythology. Nevertheless, he was popular enough to have twelve temples and sanctuaries dedicated to him. His popularity was attributed to his powers as a healer and a seer. According to myth, he was not born, but emerged from a spring, located near his temple, in the vicinity of Oropos. 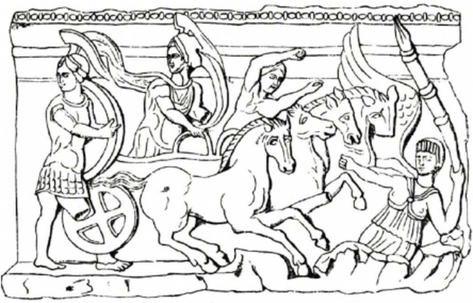 He participated in the expedition of the Argonauts, and later in the siege of Thebes by the Argeans where Zeus himself intervened saving Amphiaraos’ life. ​The most important temple dedicated to Amphiaraos is Amphiareion, located in a gorge on the border of Attica and Boeotia. An ancient theater with a capacity of 3,000 seats dominates the area. Notice the five white marble seats around the scene, with sculpted decoration and epigraphs. The temple is located in the vicinity of a spring, mentioned in the myth of Amphiaraos. It was built in the Doric style in the 4th century BC. Most of the ruins in the area were dated to 6th century BC. 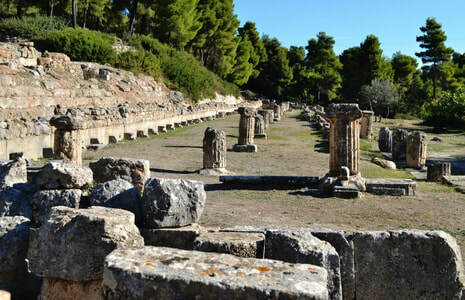 ​​Amphiareion is located 48 km from Athens. If you have a car, take the Athens-Lamia National road, and turn right on the road to Oropos. Two bus lines link Athens to Oropos, both with a stop in the vicinity of the Amphiareion archaeological area. Walk another 3 km from the bus stop to the archaeological site. Two alternative bus lines link Athens to Aghioi Apostoloi (get off at Oropos, at a distance of 3.3 km from the archaeological site), and Oropos. You can get off the bus at the Markopoulo cemetery, at a distance of 3 km from the location. You will find the bus terminal at Aigyptou Square). tel. : 210 823 0179.